Now that Seasons has been out for nearly a month, the community has produced some amazing custom content to go along with it. Here are some great examples, as well as links to where you can find them. All of the custom content here is appropriately tagged and functional. Here is some clothing perfect for a hot summer’s day! Both the child’s dress and the toddler’s dress are by Onyx Sims and can be found here and here. Fireheart CC made the teen’s dress, which can be found here. As the weather becomes cooler in colourful autumn, your sim can try this outfit on for size! This lovely jacket was made by Linky Sims, and can be found here. Winter brings beautiful icy landscapes, as well as warm, snug outfits. The hat on this sim was made by Kumikya, and his jacket was made by Deadsimz. You can find the hat here and the jacket here. This cute toddler’s outfit was made by Mama Bears Sims. You can find it here. When spring has finally sprung, you can not only dress your sims for the occasion, but use fabulous new umbrellas as well! You can get this awesome functional custom umbrella by Guilietta here, with a mod making this possible thanks to Andrew at The Sims 4 Studio. The female sim’s outfit is by Ivkasims, found here, and her awesome hat was made by LeeLeeSims1, found here. 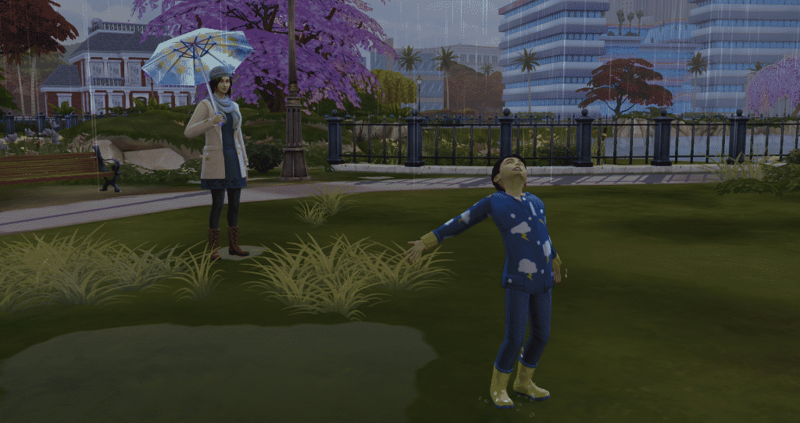 Saartje77 made the child sim’s raincoat, which is found here. A big thank you to the amazing creators of our community for creating such awesome custom content!